I spotted this on my way home the other night. It made me smile. I'm guessing it was a Christmas gift on its way home. 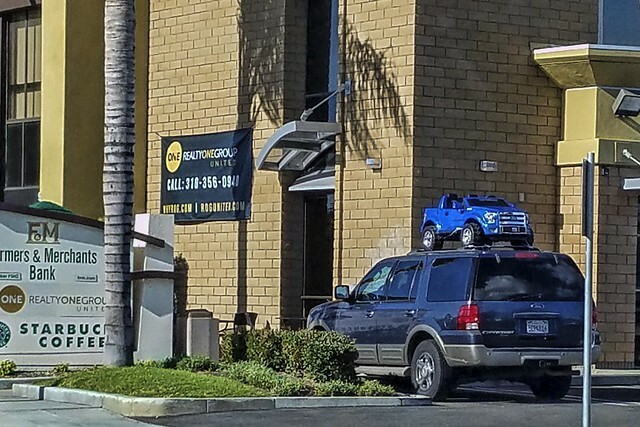 I just wonder if they parked it out front and put a bow on it. The Rose Parade never occurs on a Sunday, so when New Year's Day falls on a Sunday, the parade is moved to the following day. 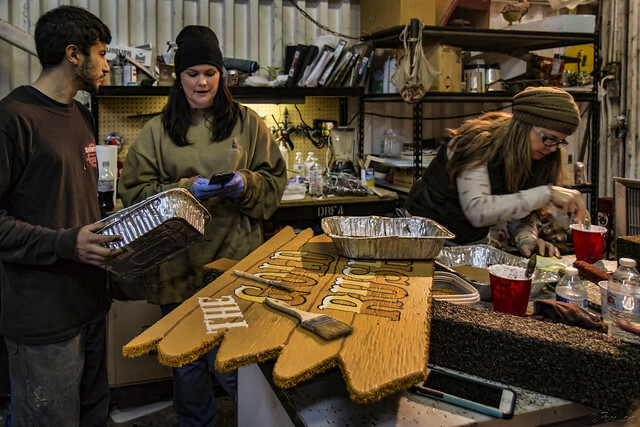 This gives all of the volunteer float workers an extra day to complete their work. 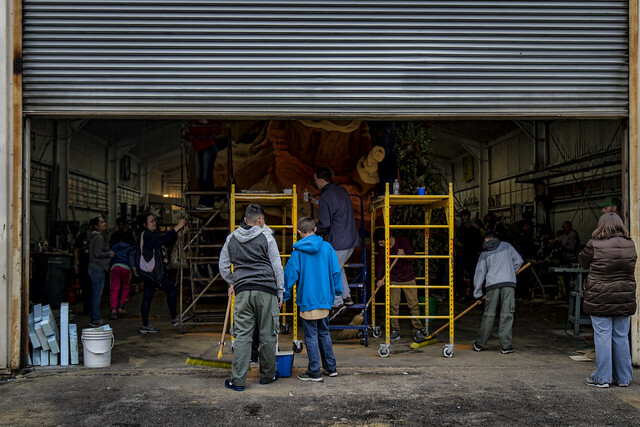 It's a good thing, because this years float is quite large, and there's a lot of work still to be done. Two more days to go! "Let me tell you the story of the 'Midnight Rescue.' One year, when they built the model, it wasn't to scale so when they built the actual float it was too large. Then, we didn't have enough help for the size of the float. The fire department was here and Channel 9 came around to tell our story. In response, over 400 community residents showed up to volunteer. Now we had too many. They still didn't finish in time and they finally pulled out of here around 9 pm. We usually pull out around 5 to get to Pasadena in time for any last minute fixes and then the judging around 3 am. My wife was on the float and a bedpost fell off and nearly hit her. "Kelly is our head builder and he worked at Knott's Berry Farm on the roller coasters. 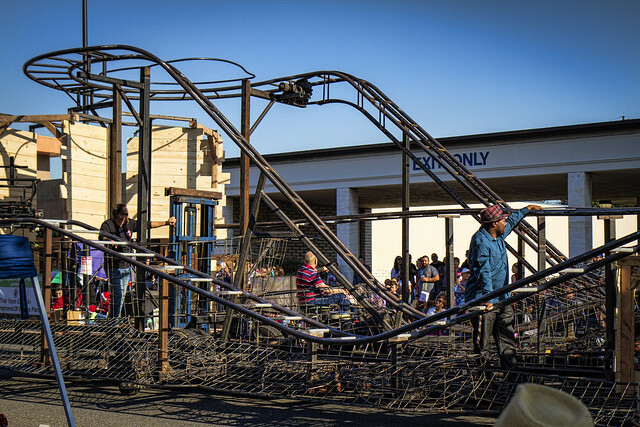 This year is the second time we've had a roller coaster on the float. During the construction of the float that had our first roller coaster, I got a call from my son asking me to bring a voltage regulator for a 1948 Ford engine. Now, where are you going to find something like that? Instead I rigged it so they had some extra fuel to run the generator for the length of the parade. But then the transmission was overheating in the parade. So, they took water from the waterfall that was on the float to cool the transmission. But they made it to the end of the route and didn't need to be towed. That would have cost us extra money." 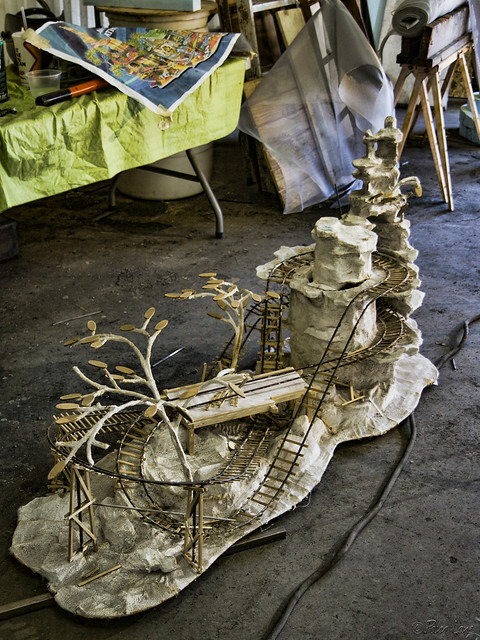 "I've been working on the Downey Rose Parade Float for over 42 years. 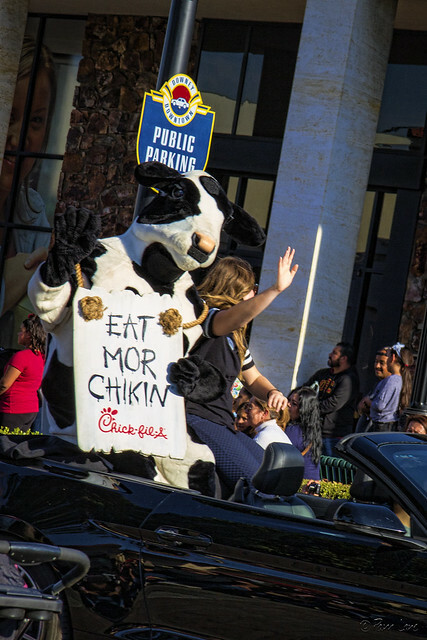 About 15 years ago we did a float called 'Fast Food Revelation.' It was kind of a replica of the original McDonald's restaurant on Florence Avenue and it happened to win the Founder's Trophy. I'm kind of happy about that one because I had a lot to do with that one. I was the guy that was in charge of decoration that year. I and a team of six other people made sure the decoration got done in time. Luckily, we didn't have any glitches in the decorations that year. "Another year, we were doing a transformer design that had the float morph into another formation. We did this by having the left and right halves of the float fold open to reveal another design inside. But the two halves were part of the new design. The inside of the two halves had some heavy canvas that had to be covered with some living stuff that would move with the canvas. We couldn't find anything that worked well enough. It just didn't look right. "In the city of Downey, I fight for historical preservation. I like to see old buildings, old houses restored and respected. I feel that if those walls could talk they would have great stories to tell us. I think it is a real tragedy that people don't see that in older buildings. I was the phone call that got the city to stop the owner of the Harvey's/Johnie's Broiler from illegally demolishing the building. It is now the Bob's Big Boy Broiler. My dad told me stories about Harvey's Broiler. He said the line used to be around the block to get into the parking lot. It was a carhop service. There were traffic cops on Firestone to direct the traffic going through. He said that at one time they even put a 15-minute time limit on parking in the lot to get food. So, if you think about all the people, all the lives, all the stories that have gone through those doors, it would be a travesty to tear it down. There have been voices, discussions inside. If those walls could tell you those discussions, those stories, we'd be a lot better off." After the rain stopped last weekend, I went outside to sweep up the puddles that formed in our back yard. 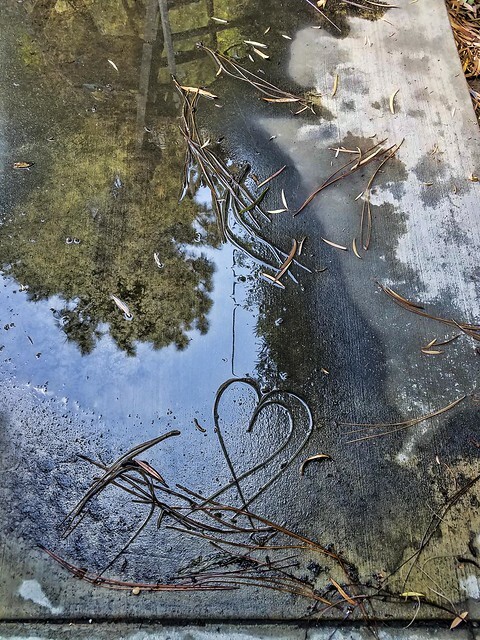 I was surprised to see this heart so artfully laid out. Normally the pine needles in my yard are the bane of my existence. They are everywhere, in every planter, in the pool, just bothersome. However, it never occurred to me until today that there could be pine needle art. It was a sweet surprise to find. Another rainstorm, another snowfall in our local mountains. And a destination for those who want to take advantage of this week between Christmas and New Years to go play in the snow before it melts away again. 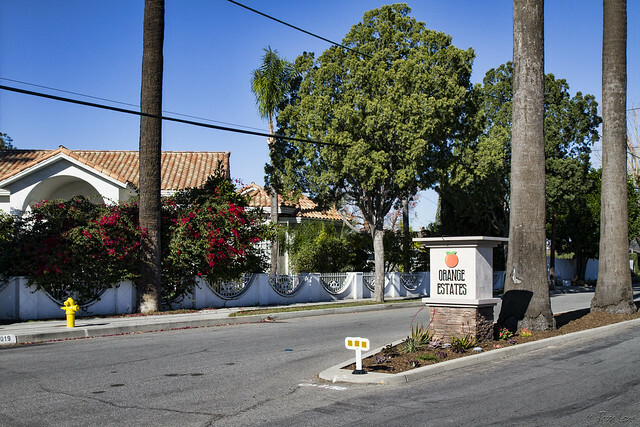 I wrote a while back (see It's official) about the new street signs appearing in the Orange Estates neighborhood of Downey. Recently, this larger marker appeared, marking the southern entrance to the neighborhood. "Christmas in Bethlehem. 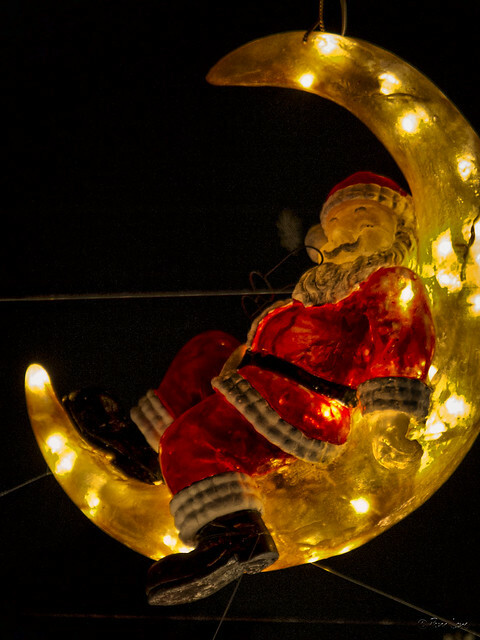 The ancient dream: a cold, clear night made brilliant by a glorious star, the smell of incense, shepherds and wise men falling to their knees in adoration of the sweet baby, the incarnation of perfect love." 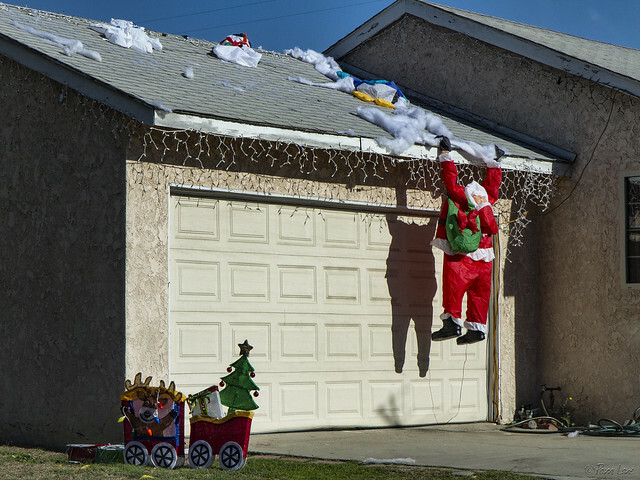 Contrary to our current rainstorm, our most likely weather around Christmas includes lots of sun, which would result in the melting snow that seems to have brought about this Santa's downfall. "I fight for my family. To make sure they are well protected, well cared for, supported, and nurtured. My son was born prematurely at 2lbs 6oz. From day one I had to work hard, because he spent seven weeks in the hospital. It was a terrifying experience to see him born that way. But it was a time of growth for me and my wife. I had to still work. My wife was at the hospital for 20 hours a day. I would work 12 hours a day and then go to the hospital to be with my wife and child. They were very tough times but very interesting times. "To protect, care for, support, and nurture my wife during this time I prayed for her, came alongside her, bringing her food, taking care of the house, taking care of the finances, and taking care of anything she needed so that she could be there wholeheartedly as much as she needed to be there." "I started a philosophy group in the Netherlands when I studied abroad for a few months. The school, which was international and had students from all over the world, had 600 students and there were 40 of them in our group. I think people were very interested in philosophy, or world views. "Now I discus wine with others. It's the same format though. You get into a discussion where you're not thinking about other things, you're not looking at your cell phone. You're just talking about a subject." P.S. Adam was the guest wine instructor at a recent birthday party we attended. Downey is close to Naples, a neighborhood in Long Beach that was created in the early 1900s as the "Dreamland of Southern California." 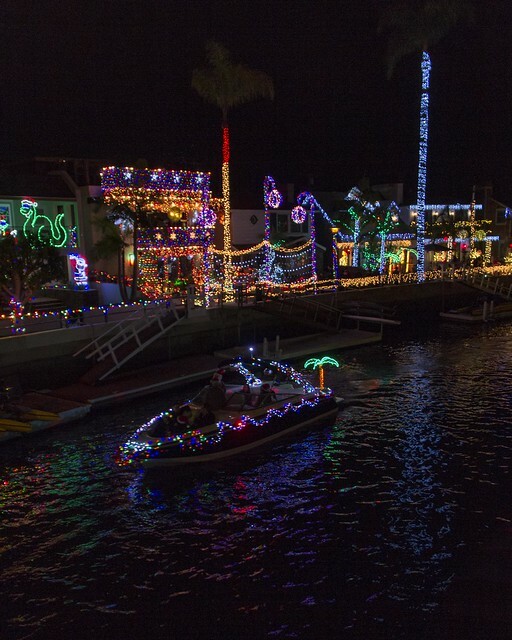 Walking along the canals and bridges to enjoy the brightly decorated houses is one of our Christmas traditions. You can certainly see why they called it the Dreamland—it feels a little like Disneyland with all the lights and decorations. It's often crowded, but tonight wasn't too bad. And, you can almost always be treated by wandering musicians playing Christmas favorites. Like snowflakes, my Christmas memories gather and dance — each beautiful, unique and too soon gone. This year's Rose Parade entry from Downey is entitled "The Gold Rush." Right now, it looks more like a pile of rust than a celebration of gold, but that will change quickly over the next couple of weeks. 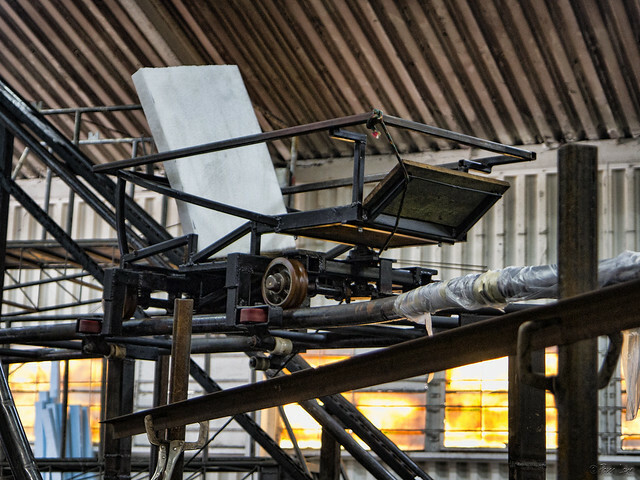 Soon, the frame will get a surface coat to serve as a base. At that point, it will start to resemble this model. Then, starting the day after Christmas, the plant material will be applied, adding the color that shows in the artist's rendering on the table. Finally, the roses and other flowers will be added on New Year's Eve day. Two weeks before the 2017 Rose Parade, Downey's entry still looks pretty bare bones. The finishing touches are being done on the frame. Mike, above, has been working on the Downey floats for 11 years, and is one of the leads on the construction crew. Mike is also the float's driver. 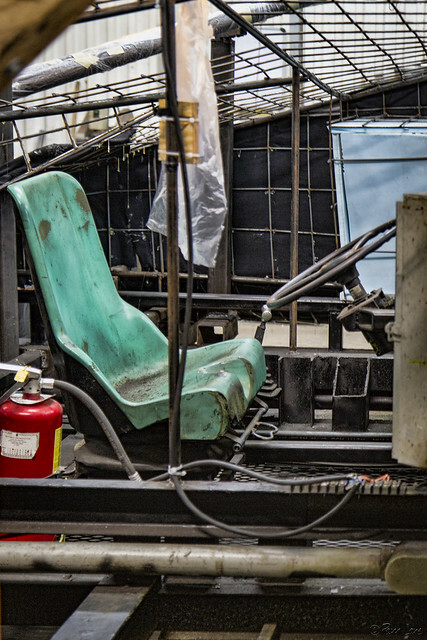 He gets to sit in that green seat for the six hours that it takes to move the float from Downey to Pasadena. Although the float is towed for the move, it still must be steered. And the only thing he can see for the entire trip is the tail end of the tow truck. And then he has to be ready for the two- to three-hour drive for the actual parade. And he's looking forward to every minute of it! 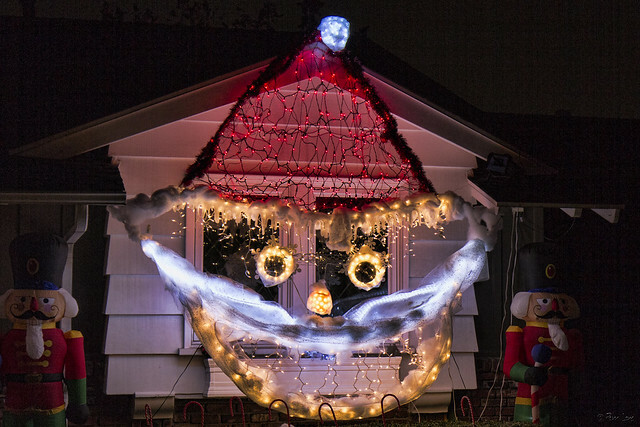 Clearly the person who lives at this house is familiar with Tim Burton. The decorations are certainly unique and demonstrate the feel of Halloween Town meeting Christmas Town. The skeletal reindeer are my personal favorite. We expect those in an iconic costume to maintain their disguise in all settings. 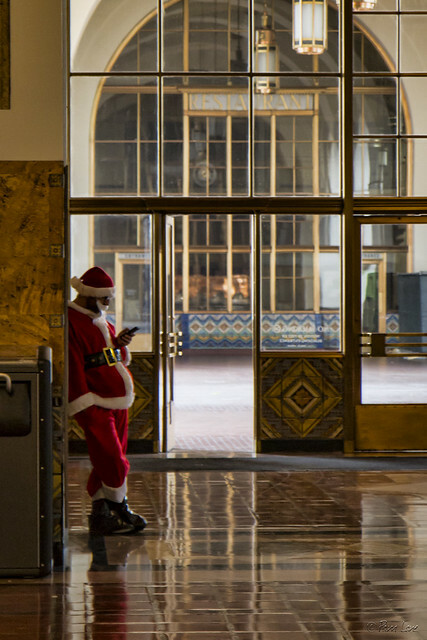 It was, therefore, somewhat jarring to see this Santa taking a break in the Los Angeles Union Station, and even more so to see him using his cell phone. Maybe it's just his updated way of checking who's naughty or nice. "The best advice I've ever received is, to treat others the way you want to be treated. My parents were the first to give me this advice but life experiences have proven it to be true. Take for instance, the grocery store. You know almost none of the people you pass in the aisles, but if you treat them nice they'll treat you nice. Say 'Hello' with a smile and they will smile back at you. What a great feeling. "Another example of this is, once I met the leader of the Vagos biker gang. You would think he'd be a scary mean dude. But no. He's very straightforward. You treat him straightforward and everything is good. I was at a friend's house and his parents were throwing a party. The dad is into bikes, though he's not in the Vagos, and one of his friends, the leader, was at the party. I met him there and he offered to teach me guitar, but my friend told him that I was already an accomplished player. So, we talked about places we had played." "Probably the biggest quirk our family has is that we are dysfunctional. "One thing I do too much of is work. I'm a small business owner in construction and I spend somewhere between 70 and 75 hours on the job every week. I have certain goals to meet my payroll and my own bills and I find I must work that much to earn enough money. Now, I would like to retire in the next 5 years or so. To do that, my thinking is that within that 5 years I'll slow down each year until I hand it off to one of my employees. 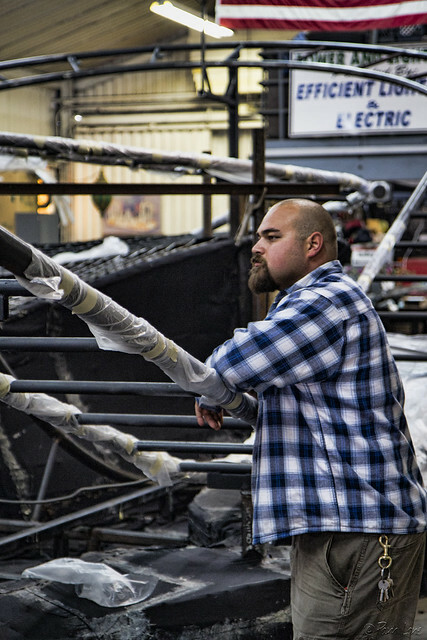 No one in my family does what I do so, I'm not building a family business. 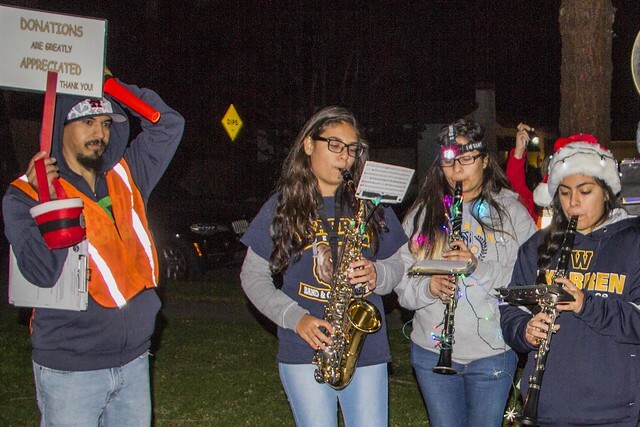 "When I was growing up, our family would vacation in Crestline. It would be my family and grandma and Joan coming up to visit. Grandma had a red 1962 Chevy Corvair and there is a very steep hill on the way up to Crestline. This hill was so steep that Grandma's Corvair couldn't make it up the hill unless she put the car in reverse and backed up that part of the road. So, every year my grandma would get to a point, turn the car around, and put it in reverse to make it up to where we were staying. Sometimes I got to go with her. It was cool. That's a picture I'll remember all my life." 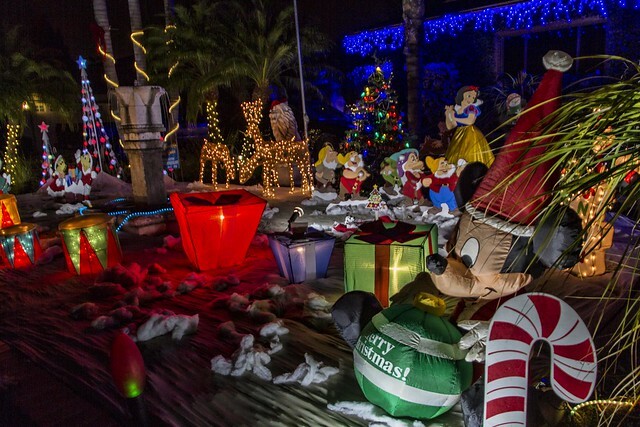 Mele Kelikimaka is Hawaiian for Merry Christmas. Clearly, I am not in Downey any more...I am back in Hawaii for the week. 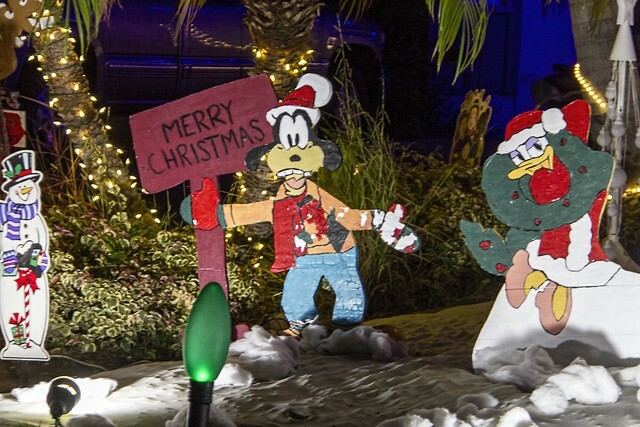 And, even in the islands, everywhere you go, there are signs of Christmas. 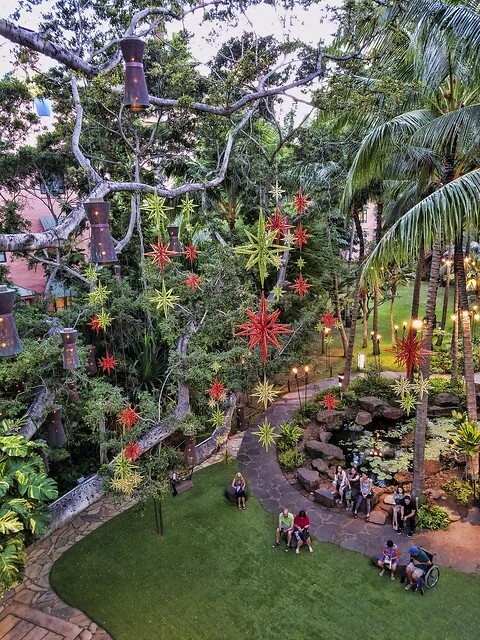 These hanging stars are in one of the outdoor areas of the Royal Hawaiian Center. 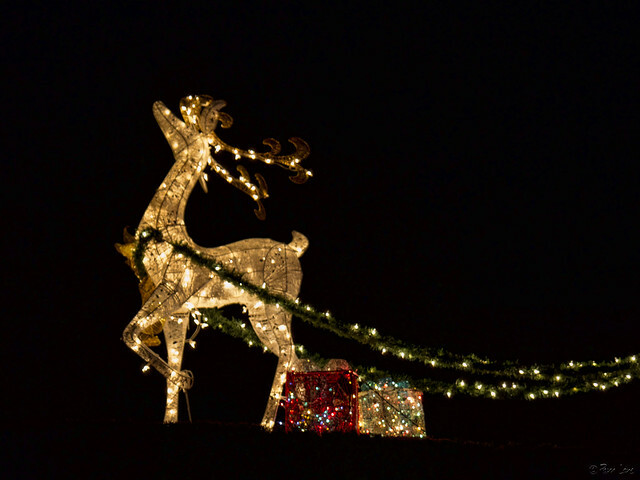 One of my favorite sights from my recent jaunt around Downey was this reindeer perched on top of a hedge. With the dark background, he looked like he was actually flying through the night. 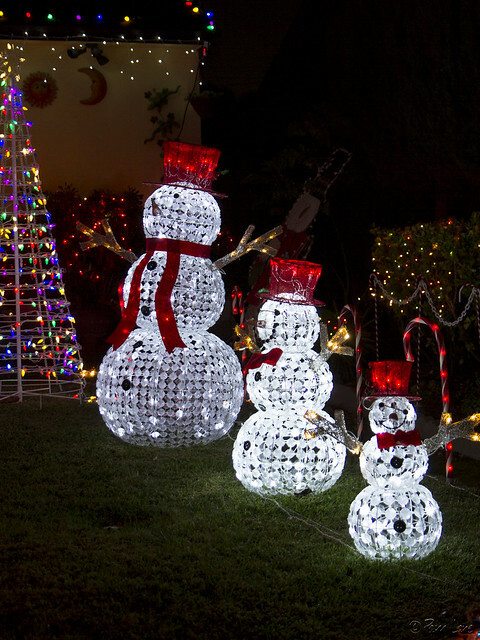 Snowmen are a very popular theme in holiday decorations. 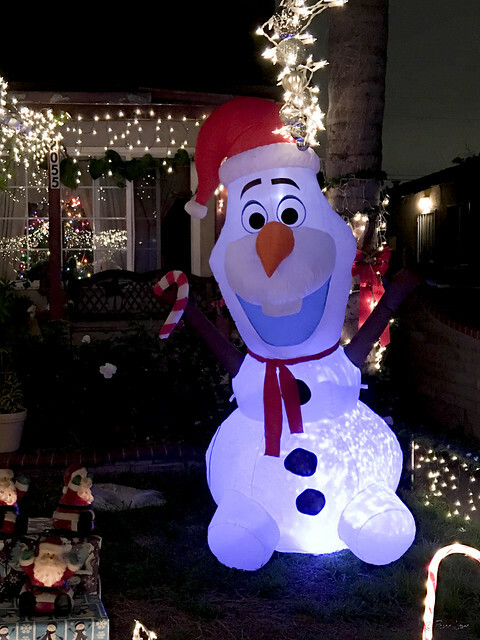 There are a lot of traditional snowmen displays around Downey, but Olaf, from the movie Frozen, is just as common these days. “Some people are just worth melting for." Continuing on with our tour of Downey's best decorations...I gotta admit, it felt a little like being back at Disneyland. I love all the lights and the color! Tonight I too used the Downey Patriot's map to check out the 2016 Holiday Home Decorating Contest winners, along with others along the way. 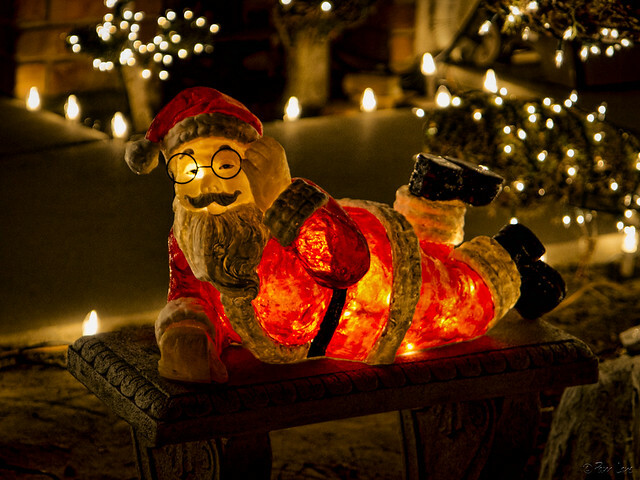 I enjoyed the many variations of Santa Claus. 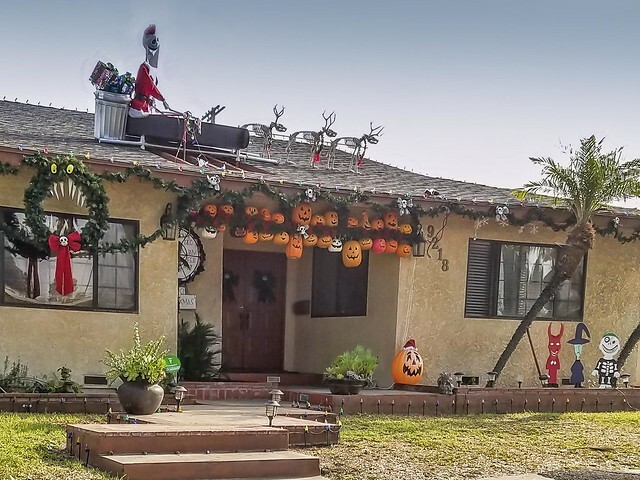 The Downey Patriot listed the winners of Downey’s 2016 Holiday Home Decorating Contest here. 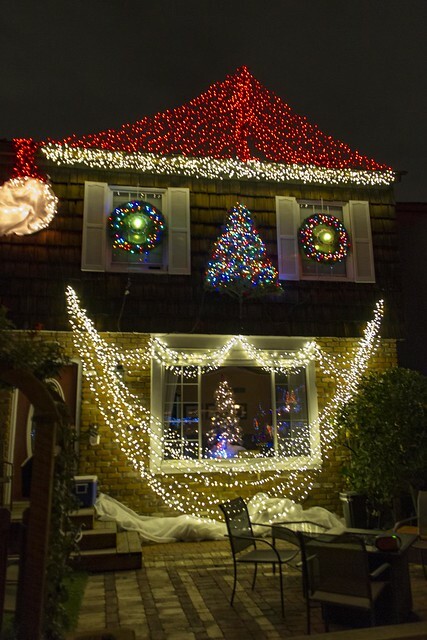 This is one of the winners. It is located at 7614 Yankey Street. 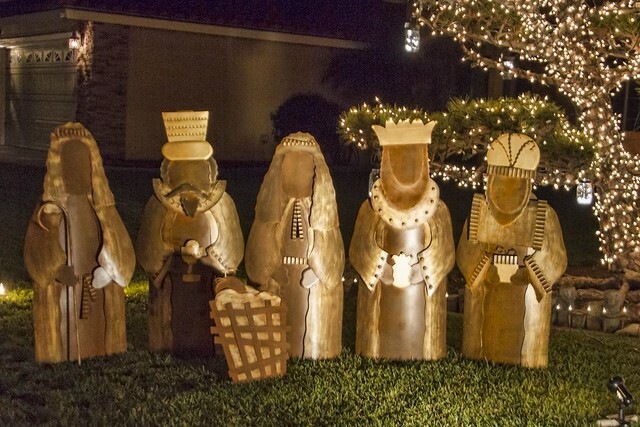 I enjoyed the layout of the nativity scene in front. It has Bible verses for the wise men, shepherds, and the baby's birth on placards. I encourage you to check out the Patriot's website to get the map of all this year's winners. The decoration even comes complete with house guards and an invitation to join them at Christmas services. "My very first car that I owned was a 1955 Dodge. I was 18 years old and I really needed a car to get me to my job as a dishwasher in Lakewood. 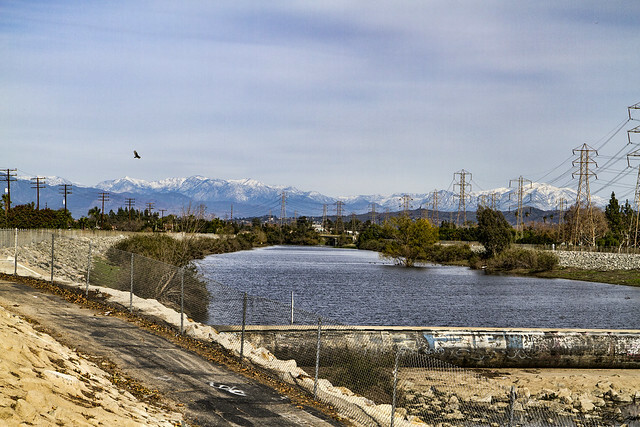 I had just arrived in this country and I was walking from Compton to Lakewood for my job. But I found the route a little dangerous when walking, so I decided to get a car. So, I saved some of my wages little by little. One of my uncles told me about a lady that was selling her car. It was stored in her garage. It only had 45,000 miles on it and I bought it for $500. I liked the style, it was clean and it ran very smooth, like a clock. I also used it to take my girlfriend out on dates. Although, she wanted me to get a '55 Chevy. But I still married her and we've been married 57 years. "A family that we were friends with were having a party that I attended. 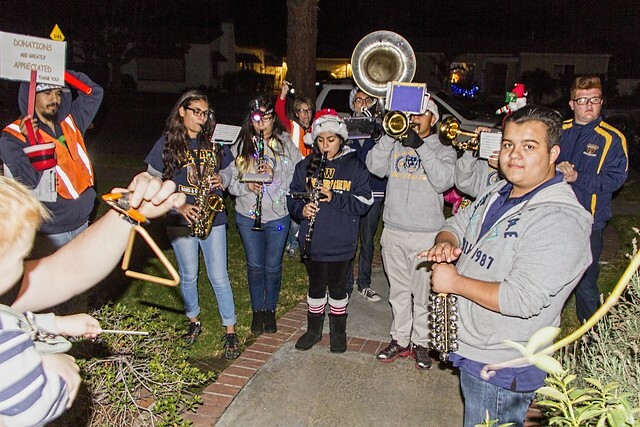 Their neighbors, who had just come back from Tijuana, Mexico, were also at the party. They had gone to Tijuana to pick up a young lady they were hiring to be a nanny for their son. She had just come up from Guadalajara. When I saw 'my wife' come walking up the driveway, I had a feeling, 'This is going to be my wife.' So, I talked with the neighbors and arranged to take her out on a date. Then more dates and after two years, we got married." P.S. Ramon is standing next to his classic '60s Lincoln Towncar which he uncovered for me to look at the interior. It has only 36,000 miles. It's nice to live in Downey and to be so close to the happiest place on earth. 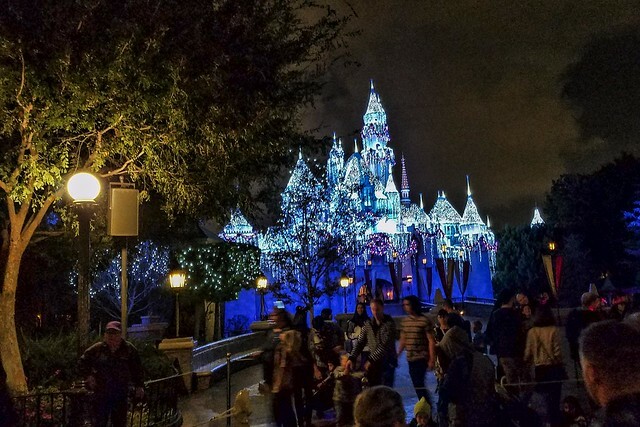 The park was decked out for Christmas with lights everywhere. I especially liked the ones on Sleeping Beauty's castle. It made it seem even more magical (if that is possible). And, of course, tired as we were, we had to stay for the fireworks. 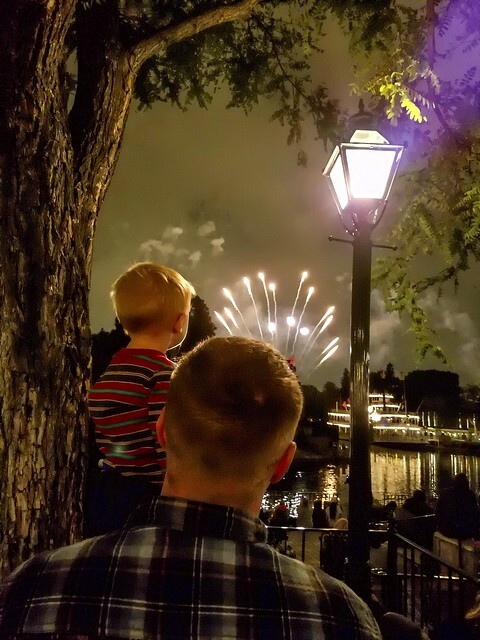 "I only hope that we never lose sight of one thing — that it was all started by a mouse." 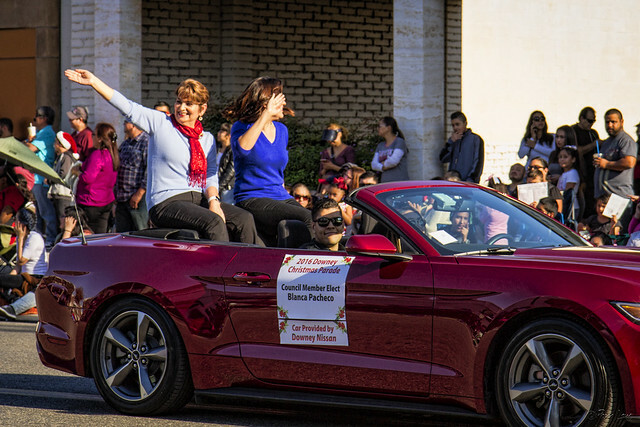 Politicians love a parade, especially after a long and complicated election year. 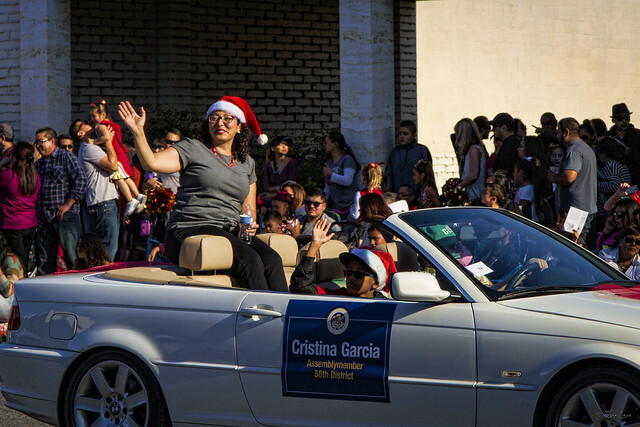 Returning Assembly Member Cristina Garcia, newly elected City Council Members Blanca Pacheo and Rick Rodriguez, and the perennially campaigning cow from Chick-Fil-A were just some of those making an appearance in this year's Christmas Parade. 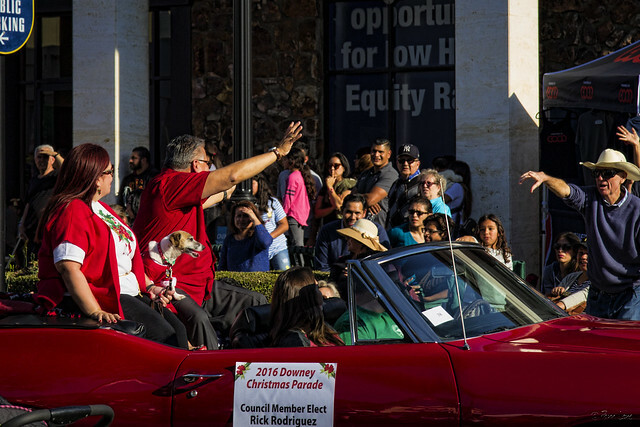 Today was time once again for the annual Downey Christmas Parade. 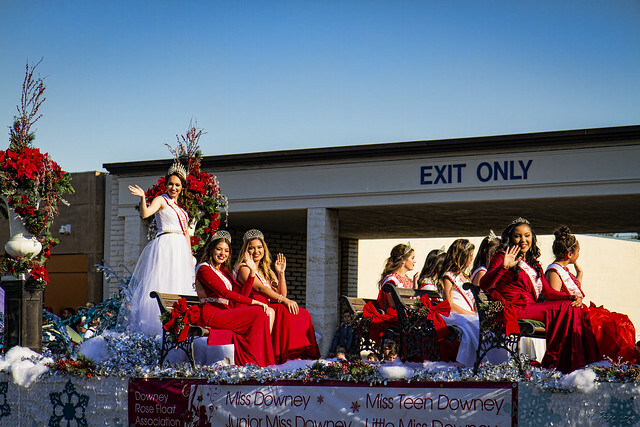 The parade, as always, includes the Miss Downey court. These are the 2016 winners, who will also ride on Downey's entry in the Rose Parade on New Year's Day. From Miss Downey Emely Lopez down to the smallest Little Miss Downey Princesses, these girls are polished and ready—quite unlike the float they will ride on, which followed them in the parade. This year's entry, entitled The Gold Rush!, is just a skeleton of the finished product, and work will continue nearly around the clock for the next few weeks. Can't wait to see the finished product! Tonight we enjoyed a couple of carols played by the Warren High Band. What a treat. We were having a gathering, so the music was enjoyed by many. They even recruited participation with the triangle! 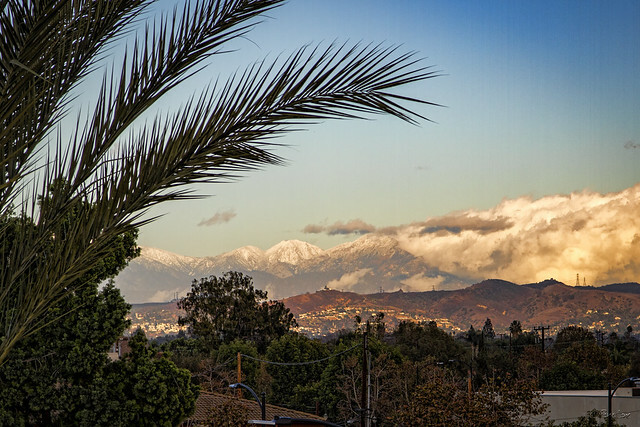 The rain last week gave us a brief glimpse of snow in the local San Gabriel Mountains. It's unusual to see so much snow there, and it didn't last long. But the clear skies, washed by the rain, provided an excellent view for me from the top of the public parking structure in downtown Downey. "I fight for fairness. When I see that things are not fair, that triggers the anger in me and I do what I can to right the wrong. Last semester, the class I was teaching, Beginning Light Design, got canceled after the third class meeting. This was particularly unfair because we had 12 students, which is a reasonable amount. But Administration arbitrarily decided to make 16 the magic number to sustain a class. I had several students that needed this class to graduate this semester. It was a required class for their major. I made a big enough stink about this injustice that I'm not back teaching this semester. I got several people angry at me in the administration. The people that I think should be out, the ones that made the arbitrary decision regarding the minimum size of the class, are still there. I think that's unfair also. "I remember when I was a little girl, my mom telling me, 'It will all get better before you get married. Just relax, it will get better.' But, the week before I got married was so stressful that I broke out in fever blisters. When I saw my mom that week I said, 'Mom, this is not going to get better before I get married.' Another thing my mom did just to save any argument was, if we had a question, like when we were driving and I would ask, 'Mom, what kind of tree is that?' she would make up an answer. So, there were tons of things I thought were gospel truth, but my mom didn't have a clue and was basically lying to us just to keep us quiet. "I'm looking forward to several short trips I'll be taking this year. One is, my sisters and I will be visiting a cousin that we haven't seen in 40 years. We got back in touch with her after my mom died and we were cleaning things out. She is the daughter of my mom's brother and he died rather young at 48. This opened a can of worms. His wife had been an alcoholic as a result of being severely depressed. She had even had electro-shock therapy. While my cousin was young they had lived with our grandmother, but the stress was too much for my grandmother, she couldn't hack it any more, so they moved to Texas. Although my mom was in contact with them through Christmas cards and the like, there was always tentative feelings left regarding the struggle with my grandmother when they lived out here. It just wasn't a close relationship. But we had some things of my uncle's that we wanted to get back to them. "I got in touch with her through Facebook and there have been several interchanges via email and stuff. Since then we have learned a lot about what was going on. Her mom finally has gotten some help and now we are going back there to meet her. She hasn't had a real stable life herself. She's been in a couple of marriages. Her daughter and her three grandchildren live with her so we won't be staying at the house. But we are anxious to see her. She asked us a while ago if any of us had any extra things that my grandmother had crocheted. My grandmother was quite the crocheter. I had the most so I sent her a box of stuff. And I may send one more thing. It's a bed-size white crocheted bedspread that I'm thinking of bringing to her when we go. I think she would appreciate it." P.S. Carol was here in Downey for the first time visiting a friend. While here, she went to Downey Landing to Christmas shop. She went to Marshall's and Pier One. She was impressed with how friendly and gracious the staff were. Always greeting her with sincerity. It made her shopping more pleasant. "The way I want my children to be like me is to be drawn to God. I love God so much, I love Jesus and I love to pray. When you love something, when you've found some place great to eat, you tell others, 'You've got to eat here. The food is great.' Because you want to share the source of your joy with others so they can feel the same joy. So, I want my children to enjoy that goodness of God. I love God and I know the power of prayer. I know the impact of having a relationship with Jesus Christ on my life. So, I pray this prayer a lot, 'God, turn my children's hearts towards you.' I pray the scriptures for my children. You can't go wrong when you pray appropriate scriptures for you children. "I've committed my life to Christ. I'm a single mom. I don't date and I've said, 'Lord, I'm your vessel, just use me.' So, I want my kids to have that attitude of 'We don't care what the World thinks. It matters what God thinks.' People are asking, 'Why don't you date? Get a boyfriend.' But, I'm so happy. I have such peace and I'm so content even in the difficult situations in my life. I want that for my kids, and others that I care about, but especially for my kids. But you can only get that from the peace of knowing Christ. "A character trait of mine that I don't want my children to replicate in their lives is having a fear of rejection or of what others think of them. Scripture says that God's perfect love casts out fear. So, I want my kids to have the character trait that trusts God in every situation. Including when others say negative things about us of when the World looks down on us. My children have been created in the image of God, so God wants them to act like it and not be afraid of what the World thinks. I want them to believe that God's love covers them and that they have the mindset that they have nothing to fear, including what others think or say. Because it won't change who they are. I want them to be confident in who they are. It doesn't matter what's said or an event that happens or a misdeed that's done to them. Nothing changes the truth that they are loved by God. And they can be confident in that." Saturday was windy and rainy and the perfect day to stay inside with the fireplace going. Sunday started out gloomy, but I headed out to run some errands anyway. 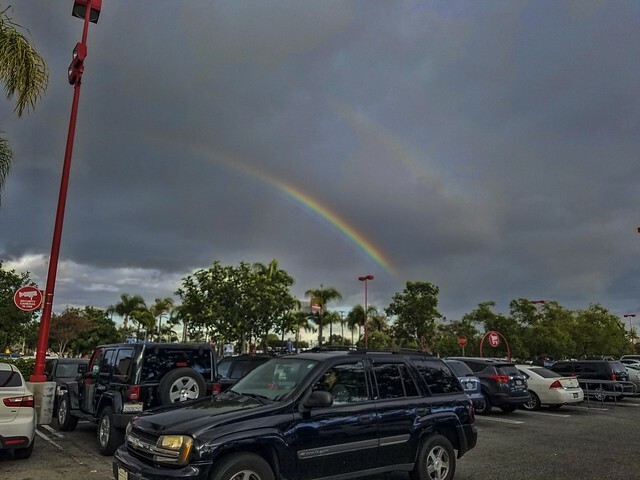 As I was walking out of Target, I was surprised by this rainbow. It looks so small in the picture, but it seemed so brilliant at the time. I wasn't the only one stopping to appreciate it and take a picture. There is something about a rainbow—seeing one always seems like a gift. Gratitude is the real treasure God wants us to find, because it isn't the pot of gold but the rainbow that colors our world.